It’s a band made up of some heavyweight musicians, and though based in Southern Wisconsin, members of The Furious Bongos have played alongside the likes of Yo Yo Ma, Les Paul, and Mick Fleetwood. 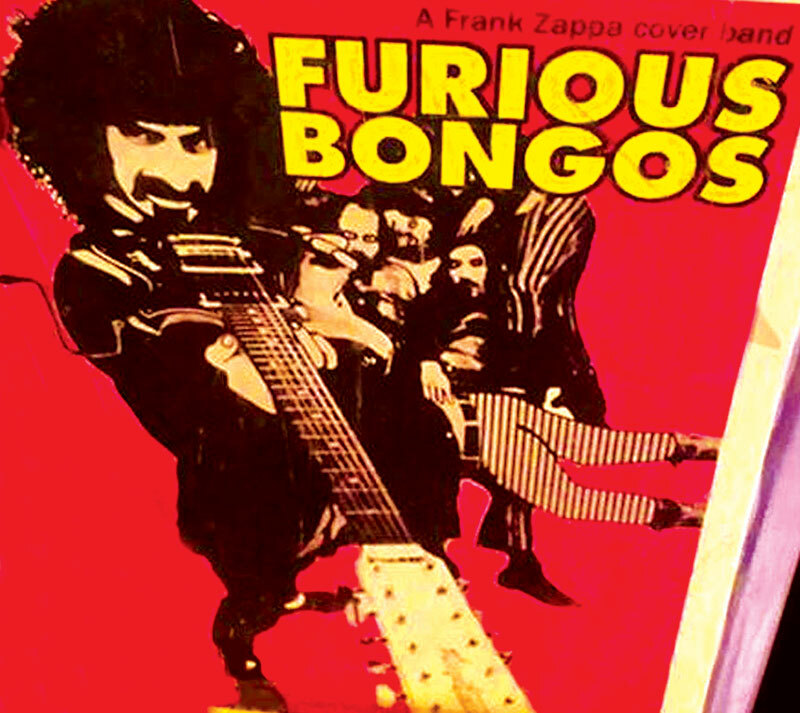 But it is the music of Frank Zappa being put in the spot light by The Furious Bongos. The group describes this venture as “not a strictly tribute project,” but more of a unique band you won’t find anywhere else. Find The Furious Bongos touring the country with a stop in Madison at the High Noon Saloon on May 19. Learn more about the group as one of its members, Lo Marie, took time to answer some questions before hitting the road. Maximum Ink: Tell me about the band. Who is in it and what instruments does everyone play? LM: Conrad St. Clair is the bassist, arranger and music director and may best be known in Madison from the band Kicksville and sound mixing at the Overture Center. Arthur Barrow plays keys, guitar, and vocals. Arthur set a goal of playing in Frank Zappa’s band, and accomplished it in 1978 and did four tours with the band and can be heard playing bass, guitar, and keyboards on about a dozen Zappa albums. Corey Crider, on vocals, enjoys an international career on opera stages and symphony halls across the globe including the Munich Philharmonic. Marcus Rezak, on guitar, is a recording artist, touring musician, session guitarist, and music theorist. He plays in the groups Katharsis, Shred is Dead, FrankenZaps Monster, and many others. Lou Caldarola plays drum kit and is a well-known session player, an instructor at School of Rock, and works constantly with a plethora of musical projects. One of his main gigs is Limelight: a Tribute to Rush, which has toured nationally for 16 years. Lo Marie sings and plays guitar and is a singer-songwriter with a particular affinity for hard grooves at chill tempos. She earned her degree in music from Vanderbilt University, and has toured the US and abroad with songs from her two award-winning albums of original material and teaches at Girls Rock Camp. Mike Massey sings and plays keys. Mike is an award winning composer, singer, songwriter, pianist, performer, and producer from Madison. Geoff Brady, of Yid Vicious plays vibes, marimba, and percussion. Plus Chris Huntington on guitar who is a veteran studio and touring guitarist and has performed live and recorded with numerous artists such as REM, The Wayfarers, Kicksville, and Leroy Thomas and the Zydeco Roadrunners. Vince Szynborski is on saxophones. MI: How did you all get together? LM: Conrad assembled the band. Knowing Zappa drew on influences ranging from Stravinsky to Leadbelly, they felt it was important to assemble musicians with backgrounds as far-flung as his influences. The result is an extremely diverse band with a serious collective resume. MI: So why a tribute to Frank Zappa? LM: It’s great music. Plain and simple. People connect to it, and want to hear more. Plus, it’s really challenging music. It has pushed all of us to grow as musicians, and that’s what really keeps me going with it. MI: Tell me about The Furious Bongos show for someone who hasn’t had the opportunity to experience it. LM: Expect it to be weirdly wonderful, always entertaining with really excellent musicianship all around. MI: You are touring in May. Is everyone looking forward to it? LM: I’M PUMPED! I’ve not done the whole tour in a van with a full band thing before. And these are all guys I whole-heartedly enjoy spending time with. They’re not just good musicians, they’re good guys all around. MI: Is there an area show we can look forward to soon? LM: Madison is our closing show of the tour! Sunday, May 19th at the High Noon Saloon.